It has been sweltering here in western Montana over the last week or so. Last night it was 95 degrees during our soccer game and we were pooped by the end. I went home and doused myself with the hose to cool off. However, despite the heat, our house stays around 75 during the day because we have all of these wonderful shade trees and I have avoided any sort of inside cooking for a few weeks. last night, however, I broke down and turned on my oven. 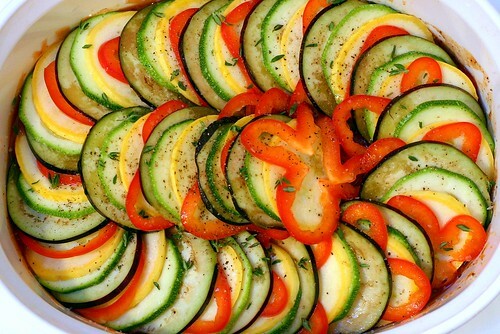 I really wanted to try this great recipe for Ratatouille from Smitten Kitchen. So colorful and it looked delish. So, I fired up the oven and went to work. It was not nearly as good looking as hers, but it tasted wonderful, despite the fact that I overcooked it a bit (just like she said not too). And now I have good lunch for the rest of the week. While I had the oven on, I decided to throw in some banana bread for breakfasts. I had some well-done bananas and some fresh cranberries I wanted to use up. So, I pulled a recipe out of Nigella Lawson's How to Be a Domestic Goddess. I have really enjoyed this book and will probably purchase it in the future (I checked it out from t he library). She includes recipes that are fairly simple, but produce a beautiful treat. Her banana bread recipe was perfect, it came out moist and melty, instead of dry and cakey. Just right. I substituted the cranberries and red wine, for her golden raisins and rum. The tartness of the cranberries really offsets the sweetness of the bananas. I had to take a picture of the mixing however, because I used farm eggs from my friend and the yolks were so yellowy-orange that the mixture was a bright, golden yellow. Now that I am done, I doubt I will turn on my oven for the next week. Stay cool everyone!